Hey Nosh Show listeners, Episode 109 is now live and waiting for you to check it out. You might be surprised that instead of me ranting about my trip to Virginia, I stay fairly quite as we have a first-time guest on the show. Will you appreciate the change up? or will you miss the nonsense? 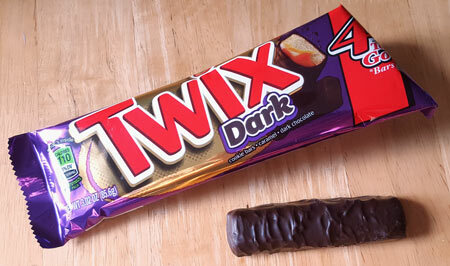 For our "new nosh" segment, I tried Dark Twix and I had a so-so first impression. Having now tried all four of the Twix in the package, I can assuredly say that I do not like them. It's not that they are terrible, it's that I appreciate them less with every serving. I just don't like how dark and unbalanced they are. They just aren't fun to me and they certainly aren't my beloved cookies & cream Twix. Show note #1: There is mention of Trader Joe's bringing cookie butter to the masses but as long term readers know it's actually Biscoff that has that honor. You might remember me using Biscoff to upgrade some terrible store brand cookie dough ice cream way back in 2011. Ahhh, I can't remember my other notes. I always think of stuff as I am listening to the show but can never really write those thoughts down since I'm most likely on my way to work. I think I was going to talk about Virginia and how little food I didn't try. We hit Jimmy John's twice but had to skip over other area staples like Cook Out and Waffle House because of allergy concerns. We'd just rather go somewhere free of cross-contamination concerns. We actually had this awesome server at Olive Garden and he told my son not to worry because he has nut allergies too. Yes we went to Olive Garden on our trip. Stop snickering. Anyway, have a good week everyone and I'll see you on Wednesday for a review! Huh...I had to get some help from Google because I never even knew that "cookies & cream" twix were ever a thing. Not sure how I'd feel about that. It sounds too sweet. It's too bad you didn't like the dark chocolate Twix. I was wondering what they'd be like mixed into a shake with "Keep Caramel and Cookie On", since it's all dark chocolate, caramel and shortbread. Yup, C&C Twix was a thing, we've mentioned it on occasion in the past because Marvo and I both remember them very fondly. It definitely was not too sweet (at least to me). They were pretty amazing and it's a shame they don't come back. Apologies for not crushing one of the dark Twix over KCCO, that would have been an interesting combo to try. I recalled that Twix was supposed to do Sugar Cookie flavor but never launched. They need do it. Maybe change up the cookie base. How about snickerdoodle or even chocolate chip. ALL CHOCOLATE TWIX. Chocolate chip cookie base, chocolate caramel, and chocolate coating. There was a "Chocolate Fudge" Twix that came out with the "Cookies n Creme" Twix but I don't remember it like I remember the C&C one. And now I'm hungry again! I guess they won't do that because Nabisco's "Brownie Batter" Oreos from August 2015 didn't sell enough for them to bring back. They were just **SNIFFLE**, they were too pure for this world! Or is this just a limited edition or some promotion Twix? I haven't seen this anywhere before.